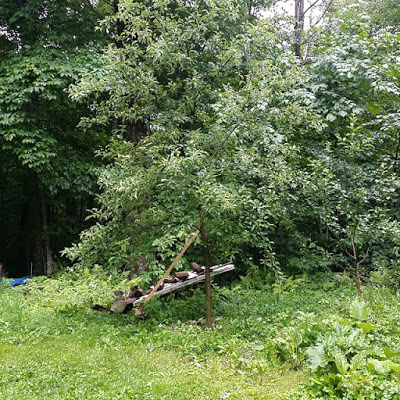 This summer, a friend and colleague asked for advice on how to take care of an apple tree that was leaning, possibly due to the amount of precipitation we had. After a few back-and-forths I mentioned that this should be a post, and now I am finally getting around to it. My wife’s family owns Adams Apple Orchard and Farm Market, where they have grown more than 900 apple trees since the early 1970s. They grow dwarf trees, mostly Macintosh, and focus on pick-your-own. Personally, I am a Honeycrisp lover, which I am told takes three times the effort for one third the fruit because it is so heavy with water. This is all to say that the information on this page is not coming from me, it is from answers to questions asked of my wife and father-in-law, and participating in dinnertime conversations. Questions from Bryan: what should one do about an apple tree that’s leaning to one side? Should I tie it to a stake to pull it back to vertical, or prop it up with a brace? Answer: The tree is relatively tall for the trunk that supports it. I think it would be beneficial to also stake it as it might be unbalanced and/or top-heavy once the fruit matures. It might be helpful to prune some height off the tree next winter. Question on staking: Should I put down several 4′ stakes and tie ’em to the tree with twine? Question on pruning: Only in the winter? Answer: The best time to prune apple trees is in late winter or early spring before any new growth starts and it is easier to see what you are doing without the foliage. Question on height: How high should the maximum be 10′? Answer: The max height depends on the diameter of the truck and what kind of tree you have. There are different standards for standard, dwarf and semi-dwarf trees. Try to get a ball-shape, similar to what you see in illustrations, so that there is an even diameter around the tree. Favor keeping nodes that have three branches. Practical answer from Farmer John: If you want to pick fruit from your tree, don’t let it grow any taller than you can reach. If you have an 8′ ladder, don’t let it grow taller than 10′. NOTE: you want a sensible answer, ask a farmer. Question on nodes: Does “node” mean a branch emanating from the trunk? Answer: A “node” is anywhere the branches split, it can be off the main trunk or anywhere along the hierarchy of branches. This helps with the balance and the look. So favor nodes with three branches coming out. 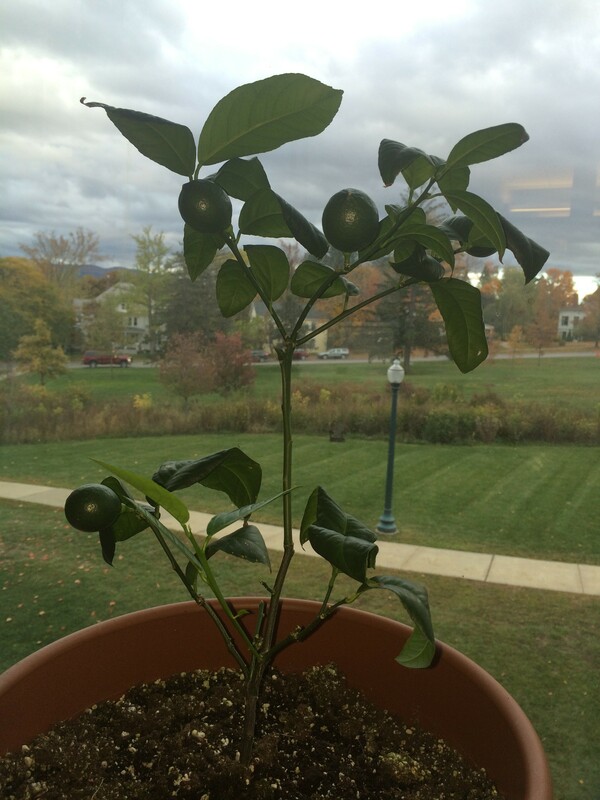 In addition to sharing advice, I am taking it while growing a lemon and a lime tree in my office. Who knew you could grow citrus in a climate-controlled library.